Social media has dramatically changed the way people communicate, share content and consume news. Billions of people spend hours each day on social networks like Facebook, Instagram, YouTube and Snapchat viewing, contributing or commenting on the available content. Bill Gates seemed to be right back in 1996 when he predicted: “Content is King”. The social media platforms that have dominated the space all have a unique content focus that has made them compelling to their users. The largest social networks place an emphasis on communities and therefore community building. User’s are tasked with developing their network of friends to share their content with. For example, the breadth of content shared via Facebook, Twitter or WhatsApp show that the type of content is largely irrelevant, it’s the size of the community its directed to that is important. This is why Facebook displays the number of friends each user has, offers advanced search tools to locate friends and analyzes user activity to make friend recommendations. There are more subtle but powerful features to encourage larger communities too. The larger the community that views the content you’ve shared, the more ‘likes’ you can potentially receive. As the sheer volume of content can be almost overwhelming at times and visual appeal could be an important attribute to ensure the content actually gets consumed by the communities. Recognizing this, social networks like Instagram and Snapchat arose with a focus on the visual appeal of the content. Communities are still an important element but they’re secondary to the quality or entertainment value of the content. Their feature sets are intended to provide users the ability to improve the appeal of the content or dress up the content so it captures more attention. It’s interesting to see how these two platforms are now overlapping features and if one of them will provide further innovations in the presentation of content. Sharing how we feel is probably the most cherished reason why people communicate. It’s also an area where the “who’s” and “what’s” of the social media world aren’t particularly adept at providing. When content comes from all corners and communities are filled with such a broad range of relationships it becomes difficult to convey emotion or meaning and in many cases doing so seems to be completely inappropriate. Because of this, their users aren’t willing to intersperse these personal, emotional experiences with their typical content volume. Due to the bespoke nature and sensitivity of the content, a social network would really need to be solely focused on fulfilling user’s emotional content needs. A network with this purpose must perfectly convey sentiments so there are no misunderstandings and the resulting experiences are preserved and can be shared while honoring the participants’ expectation of privacy of course. The experience of both sending and receiving must highlight the thoughtfulness and meaning of the content. Bequeathit was created to fill this void in digital communications. Expressing your feelings can take courage and knowing that they can be kept private is crucial to ensure complete honesty. Bequeathit takes the sanctity of these moments very seriously. When a user creates a “Bequeath” they can choose whether their video, image or message should be shared with only the recipient or can be viewed by their community. When the recipient opens a Bequeath their reaction is captured on video so that the “moment of truth” can be shared. If they decide to share it, their reaction may cause them to want the moment to be private. For these reasons if either party decides a message should be private between them it is. A Bequeath can only be seen by their communities if both agree it is acceptable for public viewing. Either party also has the ability to share their content on Facebook when it has been agreed to be suitable for public viewing. Under certain conditions, users have the ability to send a Bequeath anonymously. Maybe a friend is having a particularly bad day and you want to let them know the universe isn’t against them and they aren’t alone without revealing your identity. This feature allows users to do something worthwhile without seeking any recognition. Of course, there are limitations on the use of this feature; younger users cannot receive any anonymous messages and any user can choose to avoid them as well if they desire. Anonymity can be a wonderful thing in the proper environment and Bequeathit provides one. Another fear people have when expressing themselves is receiving criticism or negative attention from it. This makes the traditional validation mechanisms in social media unfitting. “Likes” just aren’t really of value when the community doesn’t know the context and it would be a disservice to not allow messages to be validated because they were private. For this reason, Bequeathit validates every content contribution with a tailored, uplifting message to affirm the value of those feelings. Conveying feelings are typically handled by an emoji (or 10) added to the end of a post or message. This leaves them open to interpretation, does a smiley face make you happy or are you being sarcastic? The reality is it will be deciphered by the community in many different ways because some will lack context. Bequeathit presents emoji in an easily understandable, organized arrangement that helps the user find the perfect sentiment for their message and ensures that is clear to the recipient. Simply gesture in the right direction to locate your ideal emotion and the large emoji animates with a clear label so there is no confusion. No more scrolling through endless keyboard pages looking at tiny, random faces to define your feelings. The moments shared on Bequeathit would never be intended to disappear in 15 seconds or be buried by thousands of cat videos and never seen again. To ensure these special moments can be relived and commented on there are filters to help users quickly locate each one. You can narrow your view to a specific connection, understanding you can only see their public messages unless you are a party to a private one of course. You can also sort by an inspiration, emoji or privacy setting to help find the moment you’re looking for. You can also give it a try by downloading free from iTunes and Play Store. 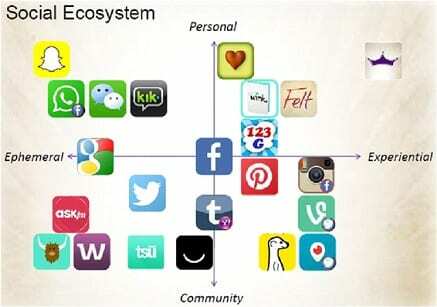 With all the options available, which social network is the right one to use? It should come down to the focus of your message. To reach a large audience with general information or consume some yourself, Facebook and Twitter seem like the obvious choices. For visual stimulation, networks like Instagram and Snapchat are very effective. For messages that require emotion, privacy, context or may stand the test of time there is now Bequeathit. These types of networks are all able to co-exist and in some cases, there could be opportunities to collaborate on content or between communities to bring more value to users. With the lack of empathy and compassion sometimes shown on other social channels, Bequeathit is a welcome addition to the social media landscape. A place like Bequeathit to browse positive experiences and see the best in humanity is more than welcome. This side of human interaction has been neglected too long and needs to become a part of our everyday lives, even if its just a small one.